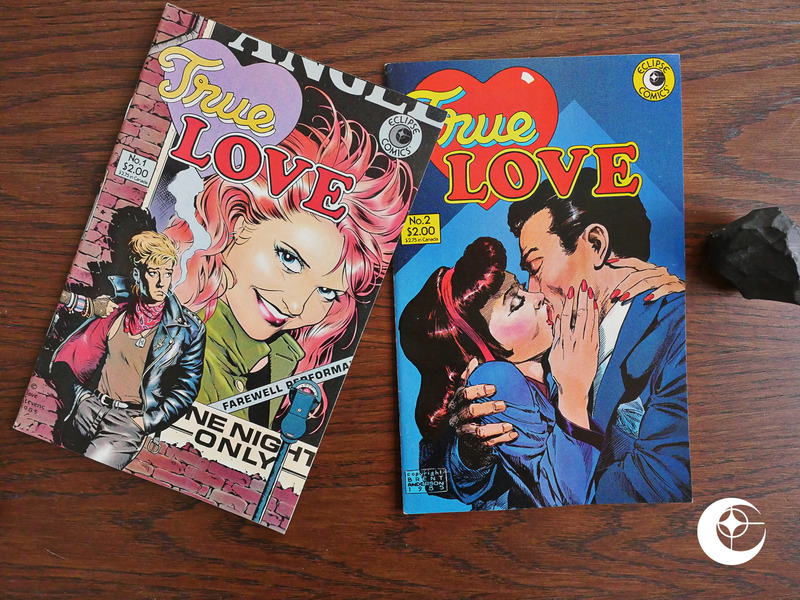 True Love (1986) #1-2 edited by Jim Vadeboncoeur, jr.
… when I read that the editor was Jim Vadeboncoeur, jr, I perked up, because he was the driving force behind the Seduction of the Innocent reprint series, and that was definitely a cut above most of these reprint books. True Love is apparently so much part of that first series that Eclipse forgot to edit out the references to it in that box at the bottom. About half the pages in these issues have Alex Toth/Mike Peppe artwork, and it’s so sharp it bleeds. It’s shot from the original artwork, too, so the linework is really allowed to shine. 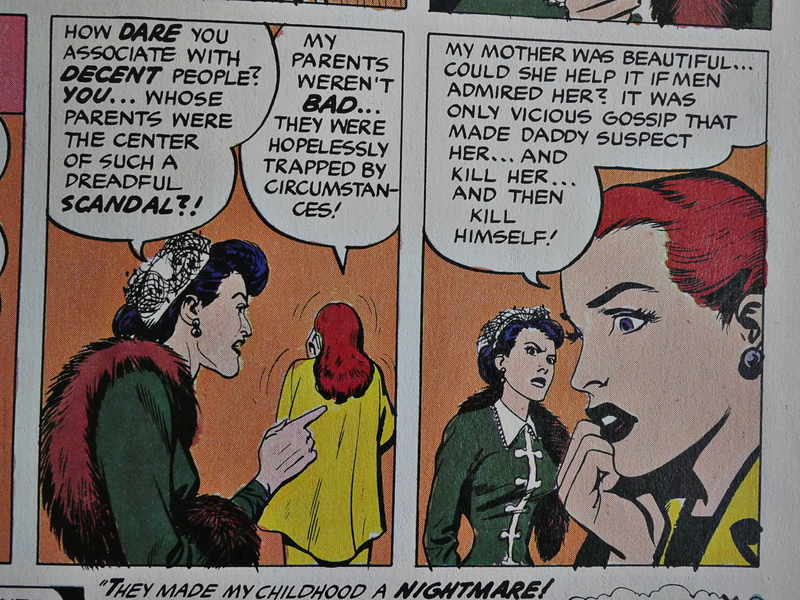 The layouts aren’t, though, but they’re delightfully screwy in their own way. I love Toth’s weird framing choices here: Too-close close-up from the front; 180 degree reverse shot of the back of their heads from a further distance; and then full figures oddly shoved off to the right corner. It’s dizzying and it’s great. These are love stories, of course, so we get lots of meet cutes and so many plot twists. But they’re fun and they’re fresh. 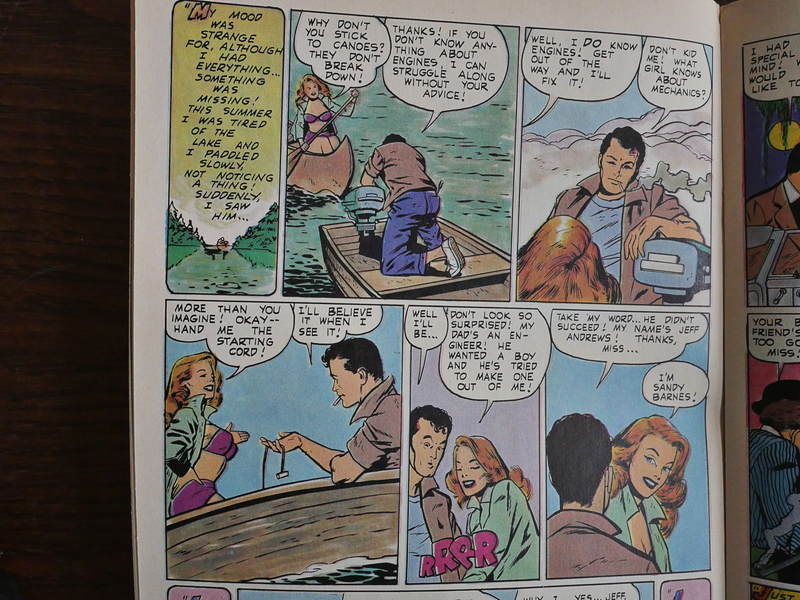 This one, drawn by Vince Coletta (in a style prettier than he would use later as a Marvel super-hero artist), doesn’t go anywhere you might guess by the panels above. 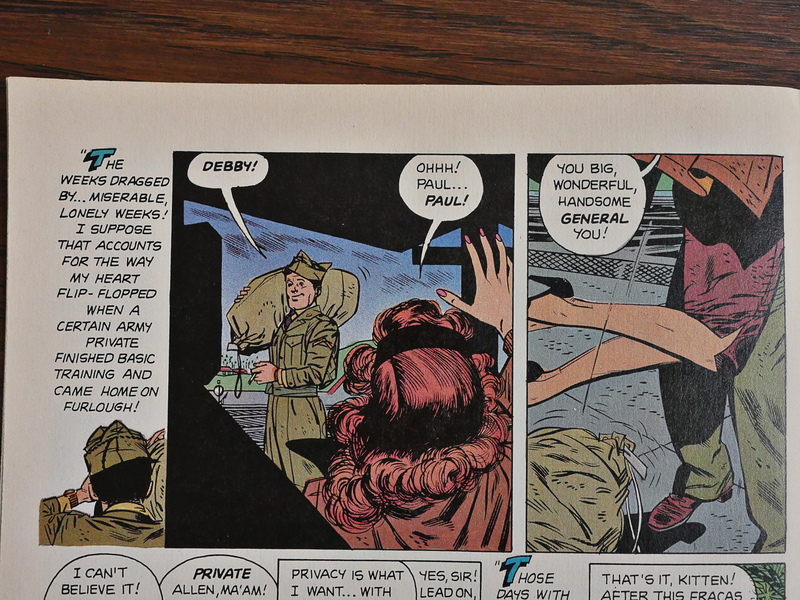 However, there’s also the ones (like the above drawn by Nick Cardy) that goes exactly where you’d expect. But that’s OK, too. More Toth/Peppe action. I mean… Nobody else does framing like that. The stories are more modern than I would have guessed: Here a woman has to lie her way into the workplace to support her husband while he finishes off college. 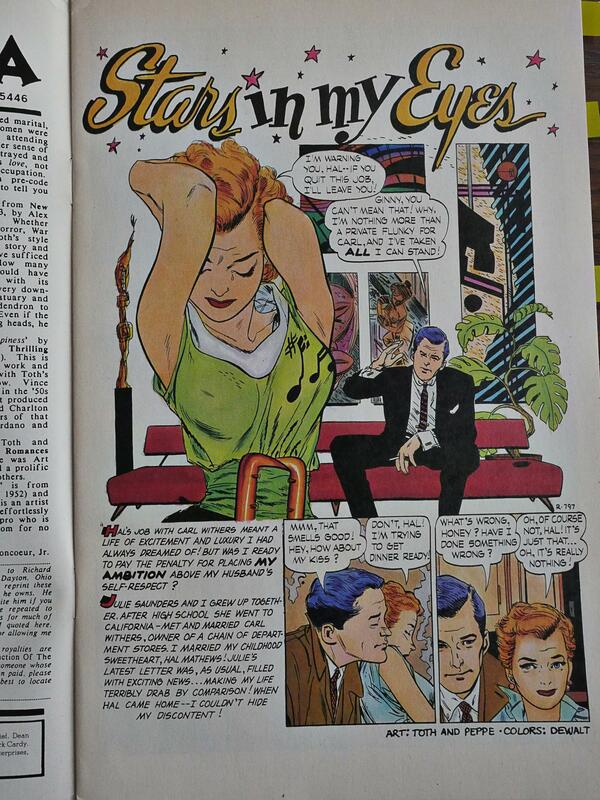 The artwork by Nick Cardy is super lush. Two issues of this stuff isn’t enough, but I guess it didn’t sell? 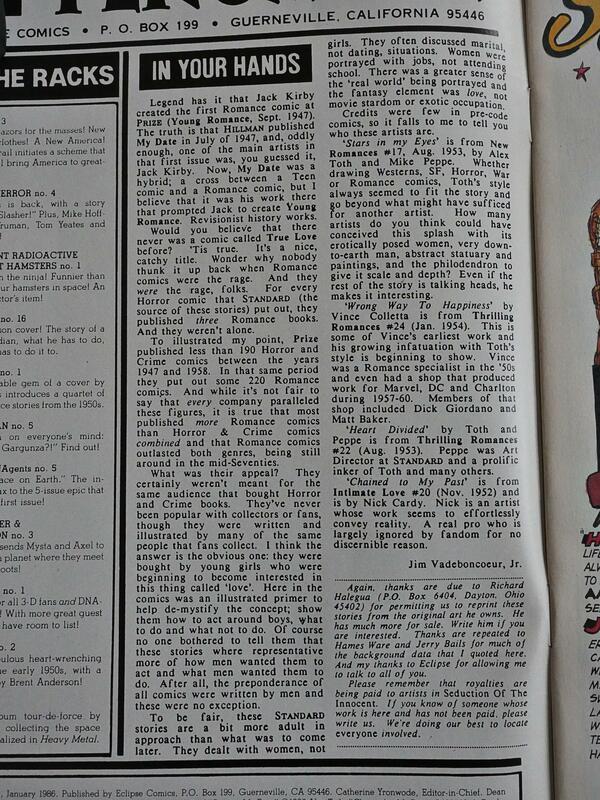 Jim Vadeboncoeur, jr sure had good taste when picking out pieces to reprint. 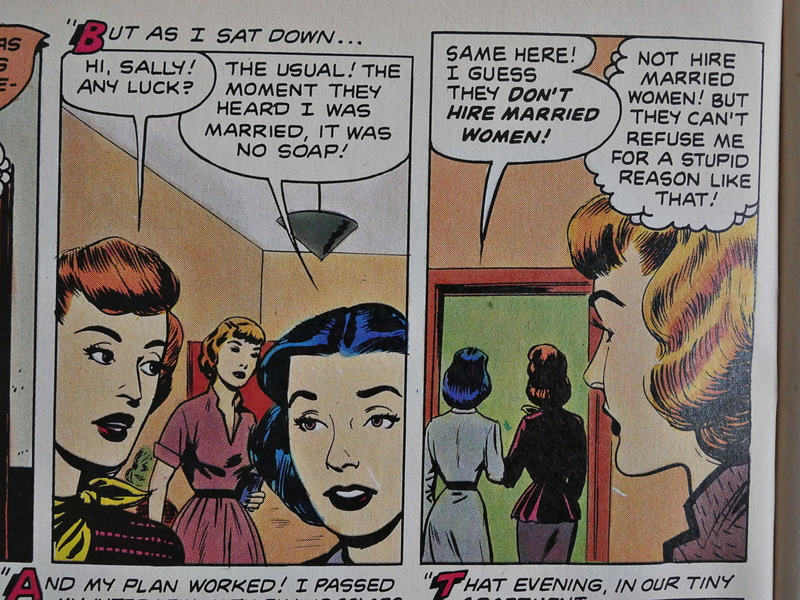 And then there’s True Love, reprints of Standard romance comics from the ’50s. Issue has a supremely charming cover by Dave Stevens, and inside it’s pretty women by Toth, Cardy, and Colletta (Who proves that when aping Toth, even Vince Colletta can do tolerable work). 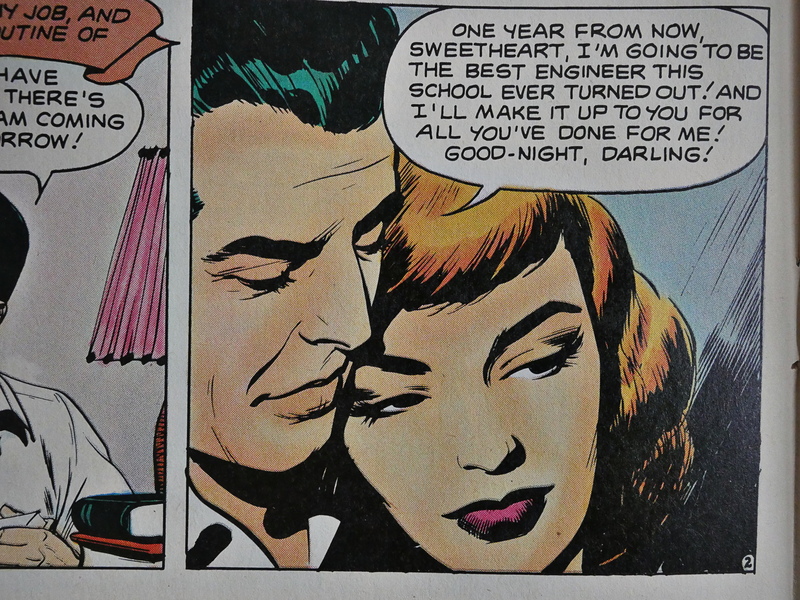 […] Toth’s in particular is a tour de force that gives these tired little melodramas a highly Romantic lushness. Every expression is hyperbolically pensive and full Of meaning. 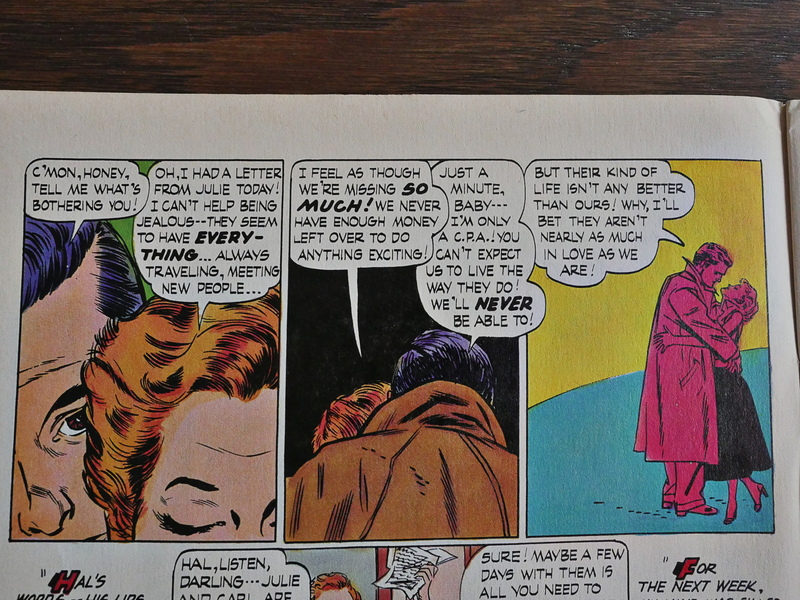 As sappy as these stories may be, they are still comics that worked in completely naturalistic terms, something all too rare.